These glass gems are wonderful for necklaces and earrings – and I’m almost always able to ship next day after you order, so there’s still time to get your January birthday present ready. Add your own creative touch, save money, and make a gift she’ll love. This is the way we like it! P.S. 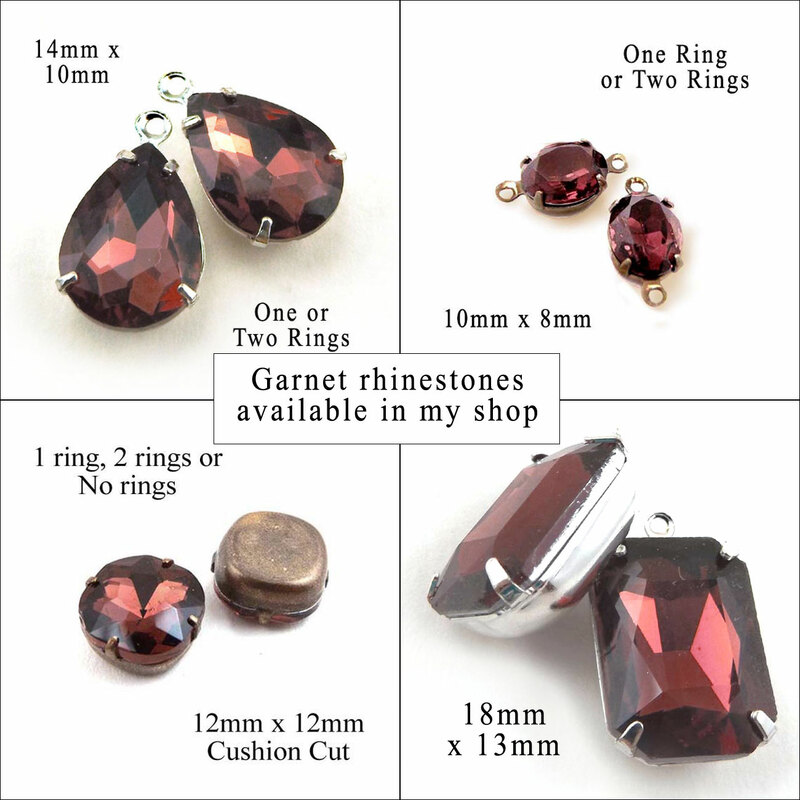 I have a few more garnet rhinestones on the way – if there’s a style or shape you need and don’t see, drop me a note – I might have it already! 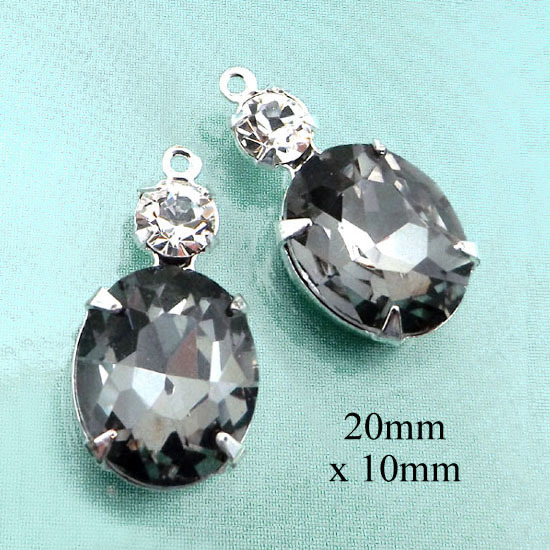 This is a really classic combination of faceted stones – sparkling crystal and faceted jet black stones. You could wear these earrings any time of year – and any time of day. But specially for evening chic! Wear them to show off a summer tan – wear them for Christmas. And did I mention New Year’s? Absolutely! You really can’t go wrong! Easy, affordable DIY earrings – great for you – great for gifts! 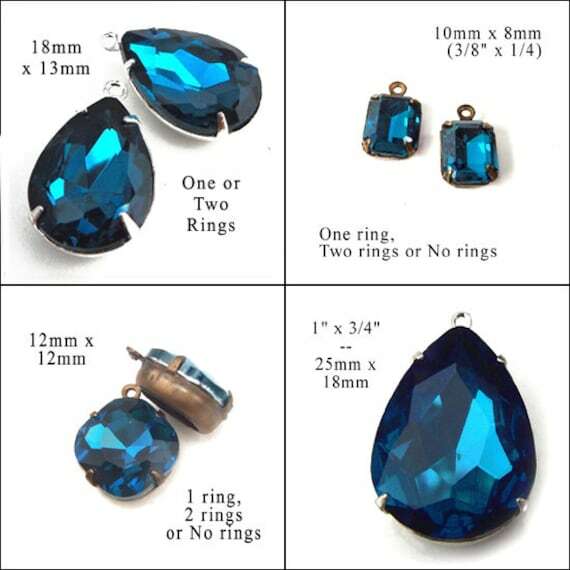 I just got the pendants – and wanted to show you a few of the other blue zircon rhinestone jewels I have in my shop right now. Love the color! and I decided the BOGO sale ought to go on a little longer. 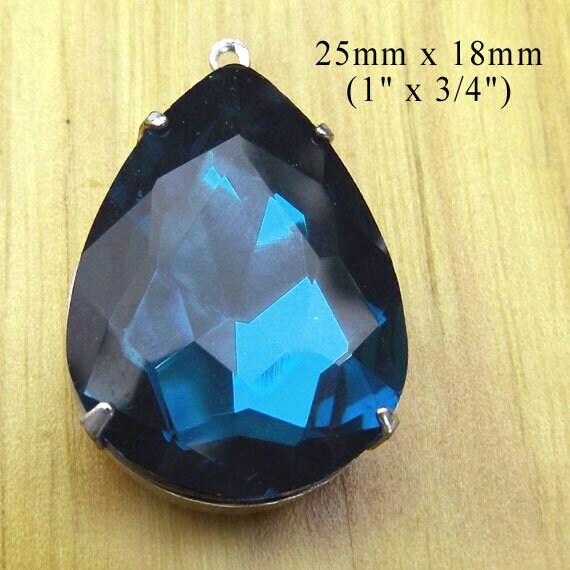 Call it an introductory special 🙂 So until midnight on September 16, 2018, you buy blue zircon glass jewels in my shop – you get a freebie. Just let me know which one you want as an equal-or-lesser-value freebie! 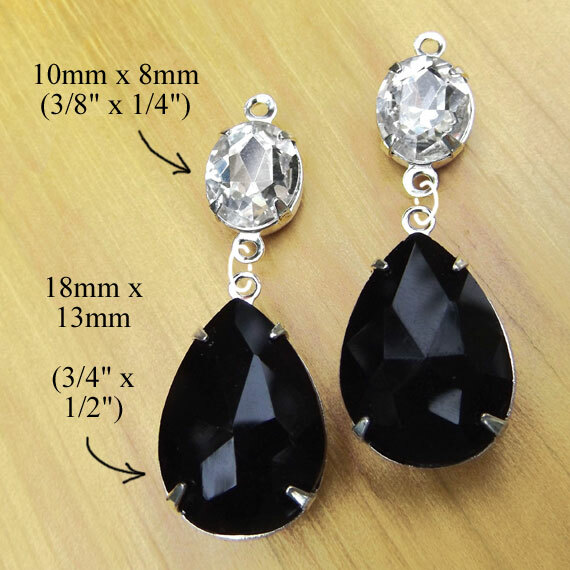 If you’re making a pair of earrings for a gift (or for sale) it’s really popular to personalize those earrings. A simple (and pretty!) 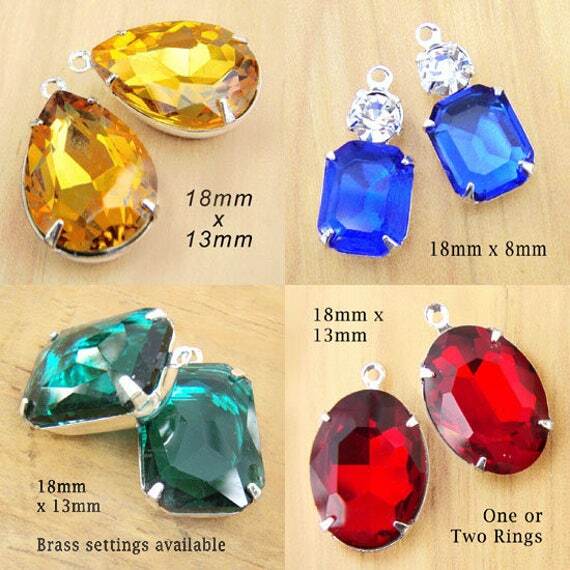 way to do that is to incorporate birthstone colors into the earring design. 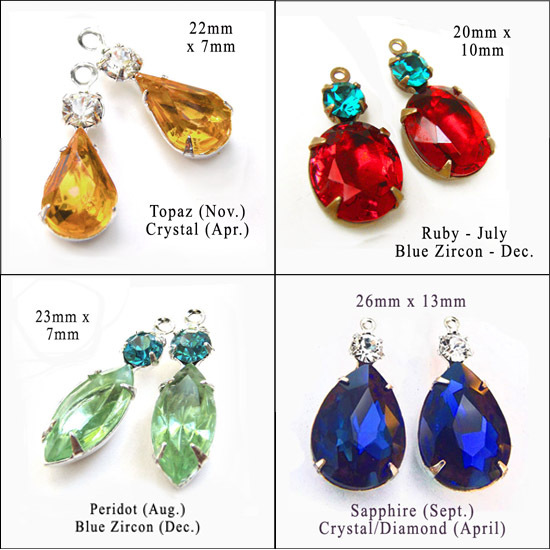 Use the giftee’s birthstone color, or maybe combine the colors of her kids’ birthdays, or maybe his-and-her colors – for example, crystal for the April birthday girl, and emerald green to represent the guy’s May birthday – combine those two colors in her earrings! I’m going to show some more ideas using birthstone colors – sometimes it helps to see color combos, and seeing one design or style can sometimes help spark a gazillion new ideas. Let’s have fun with this! And what is a torque bracelet, you ask? Basically it’s an open wire bracelet, usually doesn’t have a clasp, and can be twisted or opened to slip it onto the wrist. No worrying about fastening a fussy clasp – these just slip on. It’s an ancient design (Celtic, I think) – in the modern world. 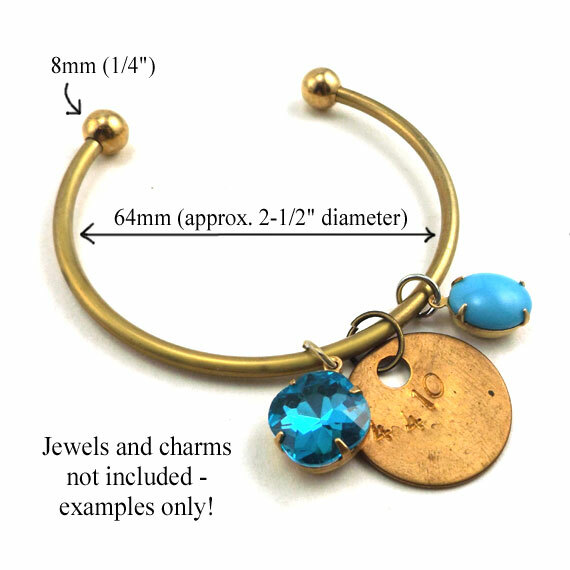 The ones I’ve got in my shop have screw-on ball ends… so you can add jewels or charms that are personal and special for your bestie, or your mom, or a customer… or yourself 🙂 Attach your charms with wire-wrapped loops, or sturdy jump rings. 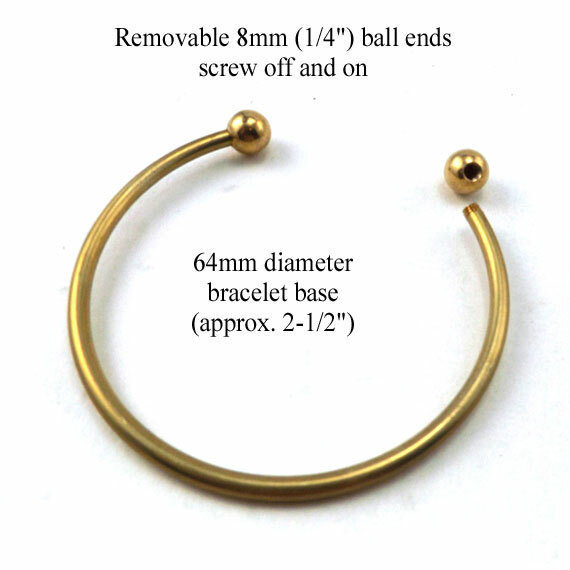 Unscrew the ball end, slip on your charms, and restore the ball end. Your charm won’t get lost! That second pic shows one example of how you can personalize your bracelet. Choose favorite colors and charms, add as many multiples as you want, and you’re good to go. Easy peasy, and fun, and did I mention these are a great buy at just $1.69? Sometimes, this is what it’s all about. 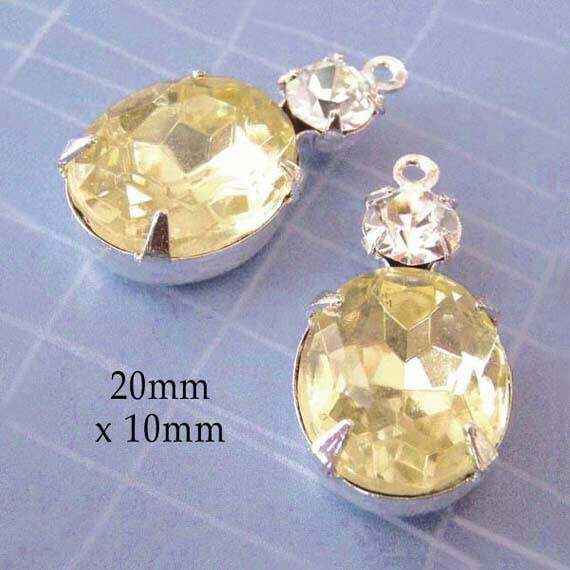 Lovely vintage glass, present rhinestone jewels in silver or brass settings. 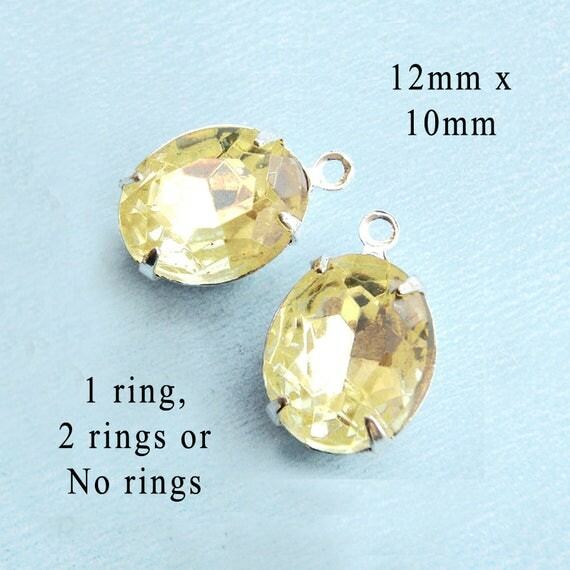 Yes, you can get them in two-ring connector or link settings, or “no-ring” settings so you can make button earrings. And those are great. But this style? Add earwires and you’re good to go. DIY jewelry supplies – give an affordable gift! For tomorrow only, September 29, 2017, from 12:01 a.m. to 11:59 p.m., every pair of glass (rhinestone) jewels is available at BOGO. Buy one pair, and get your choice for the second pair (equal or lesser value). PS This is a great opportunity to get the color your mom loves. A gift for Mom – and for you too. Win! These are a pretty color anytime – but they do feel like Spring, don’t they? And if you’d like to make a Mother’s Day gift there’s still time – these are easy to use, affordable, and have a sweet sparkle.